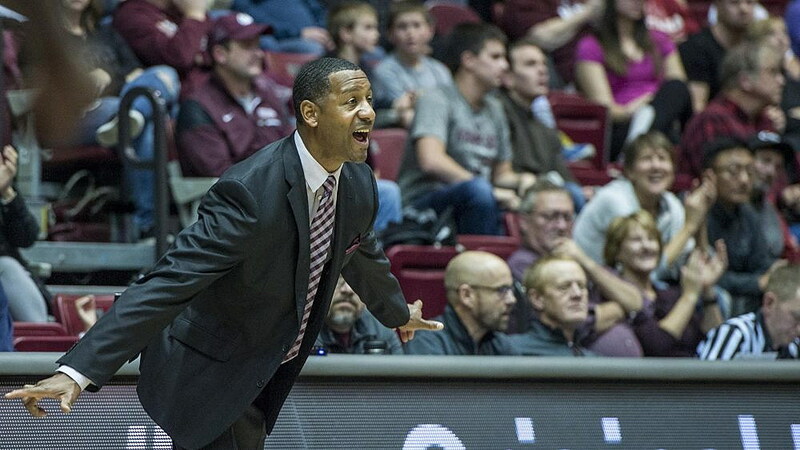 The Montana men’s basketball team returns to Dahlberg Arena Tuesday evening, at least unofficially. The team hosts Whitworth in an exhibition game Nov. 2 and Georgia State in its regular-season opener one week later, but Tuesday’s Maroon-Silver Scrimmage will be Griz fans’ first look at the 2018-19 squad. In many ways, this team doesn’t look a whole lot different from last year’s team. Back are four starters, as well as the defensive system head coach Travis DeCuire implemented prior to the start of last season. With so much continuity, though, there is still plenty of intrigue. Here are 10 things to watch for during Tuesday’s Maroon-Silver Scrimmage. Montana returns four of the five players who started all 34 games a year ago. In total, the Griz return more than 80 percent of their minutes played, scoring, assists and steals. But there’s still an open starting position up for grabs, replacing graduating senior Fabijan Krslovic (7.4 points per game, 5.1 rebounds per game). Timmy Falls and Sayeed Pridgett have the experience, being part of Montana’s seven-person rotation a year ago. Falls is more of the offensive facilitator, leading the team for assists-per-minute and three-point shooting percentage, but would also mean a three-guard starting lineup. Pridgett started 11 games as a true freshman and has played in 65 of 66 games since the start of the 2016-17 season. Montana also has four freshmen and two redshirts it could consider. Those who follow Montana basketball know what Fabijan Krslovic meant to the program over the past four years. Yes, there’s the production on the court (he finished his career ranked in the top 10 in school history for steals), but more than that was his leadership. He was called the anchor, a glue guy and a whole lot more, but the point is, when his teammates needed something – on or off the floor – Krslovic was the guy who had the answers. It’s not a role that can be forged overnight, nor is it something that can be taught with extra reps. It might not be something fans will be able to see on Tuesday alone, but it will play an important role in Montana reaching its goals come this spring. Travis DeCuire changed up his team’s defensive scheme last summer, and it ended up paying off big. The team had the best defense in the Big Sky Conference, leading the league for scoring defense (67.1 points per game), field-goal percentage defense (.402), steals (8.2) and turnover margin (+3.1). The team’s 15.4 turnovers forced per game ranked in the top 25 nationally. The defense played a big role in Montana’s success a year ago, and it will have to be replicated to do so again. The good news is, Bobby Moorehead is back for his senior season. The forward was named the team’s top defender – voted on by coaches and players, and likely Montana State’s Tyler Hall, who was shut down by Moorehead in the second half of last year’s Brawl of the Wild in Bozeman. There likely won’t be any big schematic changes, like last year’s defensive changes noted above. But DeCuire is hoping that his offense moves at a quicker pace, which will hopefully lead to even more points. The Grizzlies were one of 17 schools nationally to rank in the top 100 for scoring offense and defense in 2017-18. Michael Oguine has improved each year of his college career. Ahmaad Rorie took the next step from Year 1 to Year 2. The same should be true for Montana’s other all-conference selection, Jamar Akoh. After beginning his career at Cal State Fullerton and redshirting in 2016-17, Akoh finally got to play last season, and made his presence felt in the league. The 6-8 forward (who also completed a pair of internships over the summer) led the team with 6.6 rebounds per game and ranked third in the Big Sky with seven double-doubles. He was one of two players in the league to rank in the top 15 for scoring, rebounding and field-goal percentage. So what’s next for Akoh, and how does he adjust now that the entire league has a book on him? The return has been a long time coming for Donaven Dorsey. The Washington native spent his first two collegiate seasons at the University of Washington, and after playing in 55 games (eight starts), Dorsey decided to take his talents to Montana. First, though, was a redshirt season required by the NCAA due to transferring. Then, came the health problems (two hip surgeries), which kept him off the court again last year. Now, he’s back practicing again. He will need to shake off some rust and get back into playing shape after being away from game action for two years, but if he’s able to return to form, the Griz add a former Pac-12 player who can play down low and also has range. At this point, everyone knows about Ahmaad Rorie and Michael Oguine. The duo is not just one of the best in the Big Sky or at the mid-major level, but in the entire country. There’s a reason both have received the accolades they rightly deserve. Rorie is a two-time all-conference selection, and last week was picked by coaches and media members as the preseason player of the year. Oguine was also one of six players named to the preseason all-conference team. A year ago, he was named the league’s top defender, and the Big Sky Championship MVP. So how do they take the next step and stay ahead of everyone else in the Big Sky Conference? Sure, nearly all of Montana’s production is back, but what about the new guys? The Grizzlies signed four prep stars over the past year, in addition to adding a pair of transfers (Manuel and Seattle Pacific’s Tony Miller) who will have to sit out this year. The Grizzlies signed freshmen Mack Anderson (Bozeman, Mont. ), Freddy Brown III (Seattle, Wash.), Ben Carter (Adelaide, Australia) and Eddy Egun (Woodland Hills, California). As Kelby Kramer did (see No. 9), some of these players will likely redshirt. But some will have a role on the court, as Timmy Falls did a year ago. He won’t be able to play this year, due to NCAA transfer rules, so savor Tuesday. There’s plenty of excitement surrounding Kendal Manuel, and why not? He’s a Montana native with Pac-12 experience. Manuel spent the beginning of his collegiate career at Oregon State, where he started 25 games as a redshirt freshman in 2016-17 and averaged 7.8 points, 2.4 rebounds and 1.6 assists per game. He also made 52 three-pointers, the second-most by a freshman in OSU history. At Skyview High School in Billings, Manuel led the Falcons to a state championship in 2015, being named the tournament MVP. A student-athlete’s first year of college can be a challenge. In addition to moving away from home and adjusting to college courses, there’s a new system to learn – not to mention at an entirely different speed and physicality. It doesn’t work for everyone, but that’s why a redshirt season can be so valuable. With returning depth, the Griz coaching staff elected to redshirt Kelby Kramer a year ago, and now he comes with 25 more pounds of muscle and a much deeper appreciation for what Montana is trying to accomplish on offense and defense. Fans got a small glimpse of the No. 2 prep prospect from Wyoming during last year’s scrimmage, but aside from that, they’ve likely only seen his dance moves. Kramer can be a deep-post presence for the Griz, but he’ll also be competing for playing time with other big men Mack Anderson, Ben Carter and Peter Jones. If Montana had a weakness a year ago, it was its lack of success shooting from beyond the arc. DeCuire repeatedly said his team’s low three-point percentage (.339) and makes (5.5 per game) had less to do with its ability to make shots from long range, but instead who was taking those shots. The Grizzlies would like their percentage to be closer to the 35-40 range, so who will step up? Back is Timmy Falls, who as a true freshman converted 40.1 percent of his attempts. Bonus: How will Montana handle lofty expectations? It’s no secret that there are high expectations for this year’s basketball team. After running through the Big Sky Conference and advancing to the NCAA tournament in 2017-18, many believe the Griz should be just as good this year, if not better. Already this month Montana was picked as an overwhelming favorite to win the league again, and recently, Sports Illustrated named the Griz as one of 11 mid-major teams who have potential to make a run in March. So how does a team stay hungry and prepare for each game as an underdog, instead of the favorite it will be on most nights? To answer that, DeCuire quickly pointed back to his team’s motto: Compete with desperation every day.